The Raid: Redemption (gratuitous & inaccurate subtitle added for US release, I will not be using it again in content of posts) aka Serbuan Maut in its native Indonesia, is an action-lover’s dream in all the right ways: it provides consistently entertaining and varied scenes of stylized but gritty violence, puncuated by dramatic sequences that are just enough to make you care while not dragging on so long as to waste your time (how many otherwise spectacular action films have been ruined by “dramatic” beats that were clumsy, pretentious, overlong or all of the above?). It’s confident without being cocky, writer/director Gareth Evans being a true genre auteur rather than a winking fanboy. Longtime readers may remember that I cited this film as the main reason why it’s sometimes necessary to switch to the “retrospective” format and indeed I planned to do that here; however, upon re-watch I was surprised to learn that, despite remembering the movie being almost non-stop action after it finally revs up (minus a few necessary breathers), there are actually only five sequences amongst all that action that could be reasonably described as fight scenes. But every one a masterpiece. 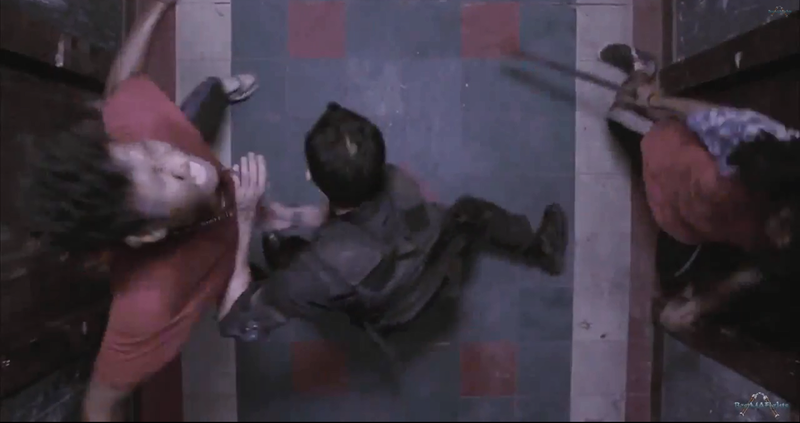 In an age where cinema is in many ways growing stagnant, The Raid is something truly special, and that’s why I timed it to be the subject of this, the 100th post of the blog. Happy Birthday, Grading Fight Scenes. Rama, the film’s noble hero. A young but extremely capable (and lucky) member of the local police force. Rama is, like the actor who plays him and also like many other characters in the movie, an expert at pencak silat. Being as that’s an umbrella term for all the varied martial arts in Indonesia, it’s hard to pinpoint any one thing that makes it unique, save for perhaps its flowing, constant motion. Played by Iko Uwais, who is destined for great things. Armed with: a standard-issue police baton and combat knife. He had an assault rifle and hand gun, but has discarded both after running out of ammo. Also still wearing most of his riot gear: flak vest, elbow & knee pads, but no helmet. Bad Guys, like 20 of them (it’s hard to keep count). Denizens of the apartment building where the titular raid occurs, they’re all foot soldiers loyal to the film’s villain. All ruthless thugs but most of them here don’t seem to have much more than rudimentary skill. Played by stunt men. Armed with: Various small sticks, blades and even a machete. The Setup: Although the plot does eventually produce a couple interesting twists, The Raid’s basic premise is refreshingly simple: 20 cops in full SWAT gear storm a building that’s run by a sadistic crime lord. From up in his perch where he has access to dozens of security cameras, the villain sics the building’s inhabitants (most of whom work for or are in some way beholden to him) on the police. Although the protagonists are largely competent and virtuous, they find themselves quickly overwhelmed, their numbers dwindled and the survivors separated. After a fantastic action sequence that culminated in an exploding refrigerator (I love this movie), our main hero Rama is stuck with his wounded but living comrade Bowo (whose only character development prior to this was “annoying jerk”), searching for safe harbor while the other remaining crew hide elsewhere. Rama drags his non-friend through a hallway on the seventh floor, but the two are quickly discovered. The Fight: Fast, mean and complex. Fortunately for Rama’s sake, the bad guys keep coming in one or two at a time. But for once this old action cliche is justified: the thugs here have mostly been conducting a spread-out, disorganized search, and all of them except for the first few are drawn by the noise, so they rush in at non-coordinated intervals. Not that these small bursts of baddies give Rama much of a chance to rest, of course; he’s constantly moving and attacking nearly the whole time, a frenzy of focused violence. He wields his baton in one hand and knife in the other, using the two weapons sometimes separately but often in concert, such as when he pulls one guy in by hooking him with the baton’s handle and then stabbing him with the knife. There’s all sorts of inventive nastiness on Rama’s part. Several times he uses the baton to “deconstruct” opponents, delivering a lightning-fast series of small blows to various points on the body, quickly & systematically overwhelming the victim. Others get slammed harshly into walls and doors. Rama stuns one thug with a club to the chest then reaches around to stab him in the back of the thigh. He stabs another in the upper thigh and then pulls the still-inserted blade nearly down to his knee. He stabs another right in the knee and then twists the knife. Throats get not just sliced but also clubbed. Over & over the knife is used for all manner of quick, punch-like stabbings, and the accompanying sound effect is suitably sickening. Rama is one ruthless SOB, but not sadistic; he’s just doing what he has to. While many if not most of the wounds he delivers are fatal, often he’s satisfied just leaving a defeated foe injured enough to not get back up again. Indeed, during one of the fight’s few lulls, as Rama creeps his way warily to a T-section of the hallway, he leaves behind a handful of groaning cripples along with all the dead & dying. One of those injured seizes Bowo just as the latter crawls to keep up with Rama, and the visibly agitated cop repeatedly stabs the thug in the chest– it’s Bowo’s sole contribution to the action and one of the film’s few moments of humor. Yep, he grabs the man, slams his head into a hallway light fixture, and then slams his head FIVE MORE TIMES down the side of the wall before dropping him. It’s… it’s beautiful. Unfortunately, Rama does not take the time to recover either of his weapons before picking up Bowo again and moving on. That will prove to be a mistake. This fight, however, is anything but. Though it’s definitely not the first bit of excitement in the movie it’s the first extended physical fight we’ve seen, and as such is as powerful a mission statement as an opening fight can be. Evans smartly turns the limited scope of the hallway into an effectively claustrophobic environment. The choreography switches seamlessly between multiple weapon types and pure hand-to-hand, and the constant stream of bad guys makes for an unpredictable threat. The filmmakers manage to find that sweet spot of being complicated without seeming complicated– there’s never really a moment where you stop and say “wait, why didn’t he just do that more simply?” or suspect the characters are showing off, it all feels very organic. Much of the credit of course goes to all the meticulous stunt work behind the scenes, but a large amount is due to Uwais as well, who sells the entire thing as natural and unforced. Physically impressive and with a highly sympathetic face, the audience is always rooting and fearful for him, because he’s not some Superman. Although he comes out here miles better than he does in any upcoming battle, Rama does absorb a couple blows here, and has a few of his own attacks stymied one way or the other. He’s awesome, but not invincible. And you know what the crazy part is? This is the least impressive fight in this movie. This entry was posted in Raid: Redemption, The and tagged 100th post, baton, knives, martial arts, melee, The Raid: Redemption. I have not seen this movie yet, and maybe you may mention this in future posts but I heard that it’s very similar to the Dredd remake that came out last year? Is this true? I did enjoy that one very much so I’m curious then if I would like this one too. It’s similar in the more basic setup: a small number of cops trapped in an apartment building, going after a dangerous crime lord at/near the top. And they also kind of have similar vibes: very graphic, no-nonsense and grim. But the execution differs significantly. The way the characters are and the dynamics between them, the way the action is presented (mostly physical vs mostly guns), the overall setting, etc. If you liked Dredd you’ll probably also like The Raid, but it’s not so much because they’re alike but because they’re both very good action movies and you ought to appreciate those. Well, Dredd is a very good action movie; The Raid is a masterpiece. The production & release times between the two films are so close that I think there’s little possibility that Dredd was influenced by (or “ripped off”) The Raid, though unfortunately some people have come to that conclusion. Plus I haven’t read any Judge Dredd comics but I believe the storyline, while original, takes its inspiration from some elements in the books which came way before The Raid was even an idea.